On the southern bank of the Lhasa River some 50 km southwest of Lhasa, Tibet, lies the village of Junba. It is surrounded by mountains on three sides and the Lhasa River on the other with scant quality soil for crops, thus this geography dictated that the villagers would be fishermen. In fact, Junba is the only fishing village in Tibet. Legend has it that the Lhasa River once overflowed with fish. So much so that the fish grew wings, blanketed the sky and blocked out the sun. God ordered Junba villagers to hunt the flying fish, and from then on Junba became a fishing village. For brothers Suolang and Puci, this legend couldn't be further from reality. 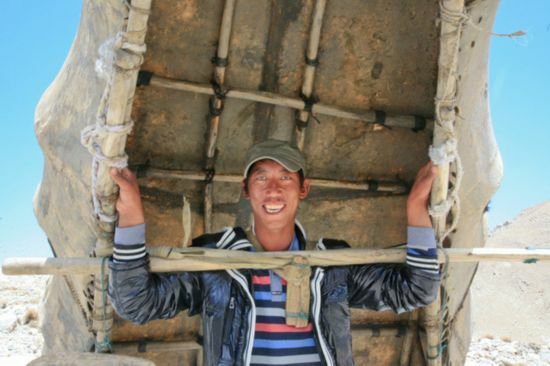 Sitting in their self-made cattle-skin boat, they check their net and find only one fish. Puffing on a cigarette, Suolang explains that this peaceful area of the Yarlung Zangbo River is the best place for fishing these days, though these days there is little optimism. "The Yarlung Zangbo has few fish now," Suolang said. "In my grandpa's time, even the poorest net could trap dozens of fish." Due to environmental disruptions, low growth and overfishing, fish in the Lhasa River have decreased sharply, and the fish still there are quite small. Most villagers have abandoned the Lhasa River and now try their luck on the Yarlung Zangbo. In the past, the fish peddlers on the streets of Lhasa came from Junba. They arrived before day break to sell, but because fish are sacred to many Tibetans due to their belief in ahimsa doctrine, the peddlers created the code words "summer radish" to represent their fish. This tacit understanding has become a long tradition in Lhasa. For generations, Junba villagers have subsisted on the bountiful fish in the rivers, but now that way of life is threatened since the population of fish in the Yarlung Zangbo is diminishing.